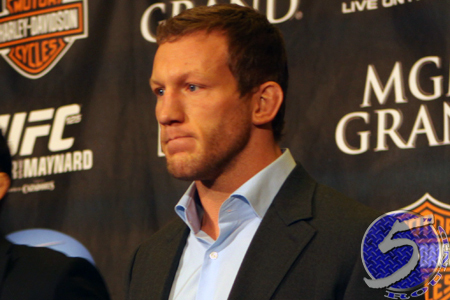 Late Monday night, a lightweight affair between former top contender Gray Maynard (pictured) and Fabricio Camoes was added to the UFC 176 roster. UFC officials confirmed the matchup via Twitter. The August 2 event takes place inside Staples Center in Los Angeles, California. Maynard will be looking to collect a much needed win after dropping three of his last four scraps, including two straight. “The Bully” was most recently TKO’d by Nate Diaz in November. Speaking of possibly fighting for your UFC life, Camoes will also be riding a two-fight skid into the tango. The Brazilian was last seen getting submitted by Jim Miller in December. The 155-pound affair will likely appear on the prelims.